The game: 12. Harvard (27-4) vs. 4. Michigan State (27-8); 8:40 ET Saturday, TNT, in Spokane, Wash.
Harvard’s defense has more than held its own against the best offenses it has played so far, holding Boston College, Connecticut and Denver below a point per possession; in 10 games against top-150 offenses, the Crimson has only twice allowed a team to score better than the national average of 1.05 points per game. But Harvard hasn’t yet faced a 6’10” behemoth capable of scoring 41 points in 24 minutes (with four threes!). The Spartans burned Wisconsin for 86 points last weekend and torched Delaware for 93 on Thursday. Harvard should provide stiffer resistance, but by how much? Superior mascot: We’ve been over this before. Even if the Spartans were merely Corinthians or Tegeans, they would surely be superior to the dye of certain insects. Critical matchup: Adreian Payne versus … well, everybody. It’s hard to think of any scheme with which Harvard — or most teams, for that matter — can shut down a 6’10”, 245-pound center who shoots 44 percent from three-point range and 78 percent from the line, but that’s the task Tommy Amaker and the Crimson will have tonight. Payne went for 41 points on 10-for-15 shooting in just 24 minutes against Delaware in the Round of 64, the second-most efficient 40+ point performance of the season, according to SI’s Luke Winn. Delaware’s defense isn’t very good, and the Blue Hens looked disinterested on that end for much of the second half, but Payne’s game was impressive in any context. Steve Moundou-Missi has struggled to guard mobile centers at the three-point line, but Harvard may have to live with Payne’s threes and hope they don’t fall. Kyle Casey isn’t at a physical disadvantage against many players, and might be a foul-trouble time bomb with lots of time against Payne one-on-one. Could Evan Cummins be effective in stretches off the bench? In any case, Harvard will probably send plenty of help Payne’s way, putting lots of pressure on its perimeter defenders to stop the Spartans’ talented guards. (A zone is also a possibility, but the Crimson’s defensive ethos is more of a switching man-to-man scheme, and it looked uncomfortable in one or two zone possessions against Cincinnati.) Payne doesn’t score 41 points every night, but it’s hard not to be scared of him after Thursday’s game. 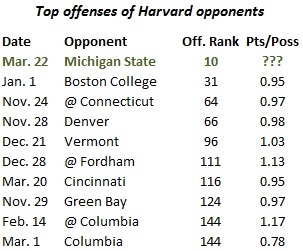 History: Harvard is 2-2 all-time against Michigan State, with all four appearances coming in the 1940s. Since then, maybe the two best Ivy League teams of the past 35 years have had their seasons ended at the Spartans’ hands in the NCAA tournament. In 1979, before Michigan State beat Indiana State in the famous Magic-Bird championship, the Spartans met 9-seed Penn in the Final Four, cruising 101-67 behind a 29-point triple-double on nearly perfect shooting from Johnson. And in 1998, a one-loss, Top 10-ranked Princeton team fell to No. 4-seeded Michigan State in the Round of 32, 63-56. One thought on Harvard: Thursday’s game was a great example of a pattern that fascinates me: Siyani Chambers is Harvard’s most visible player despite not being its best player. Chambers hit the biggest shot against Cincinnati, a pull-up jumper in the final two minutes, earning lionizing tweets from national sportswriters and lead mention in game stories. But the thing is, Chambers didn’t have a particularly good game; he shot 2-10 from the floor (6-8 FTs) with one assist, one steal and two turnovers. His final shot was huge, but even huger was the defense of Wesley Saunders and Brandyn Curry, which limited Sean Kilpatrick to a mediocre outing, and the paint play of Moundou-Missi and Casey. Because Chambers is such a visible player, however, he’s portrayed as Harvard’s star on national lists and among fans. I think that’s a bit of a disservice to other Crimson players, especially Saunders. Saunders doesn’t initiate the offense or take the hero-ball shots at the end of games, but he consistently creates opportunities inside the arc for himself and teammates, and he’s an excellent wing defender. I don’t think I would have picked Saunders as the Ivy Player of the Year (would’ve taken Justin Sears instead), but I wasn’t the least bit shocked when he won the coaches’ vote, because he is truly the best player on the best team. Winner gets: Virginia or Memphis at Madison Square Garden in the Sweet 16. The Cavaliers got a scare from 16-seed Coastal Carolina before advancing, while the Tigers held off George Washington. Prediction: The Pomeroy rankings and Vegas lines are usually pretty well-aligned, but not in this case; the Crimson is a 7.5-point underdog in sports books, while Pomeroy has the spread at only three points. Some of this is adjusting for Michigan State’s players back from injury, but there’s also a lot of public momentum behind the Spartans, stemming from two really good games in the Big Ten Tournament last week. That’s partly warranted — Michigan State has a great roster and a great coach, and showed flashes of greatness this season — but the same team lost at home to Nebraska and Illinois a month ago. The Crimson isn’t likely to win, but I sense the perception is that Harvard has no shot, and I don’t think that’s true either. Michigan State 71, Harvard 65. This entry was posted in Harvard, March Madness, Postseason Previews and tagged Adreian Payne, ancient greece, Delaware Basketball, Harvard basketball, Harvard Crimson, Ivy League basketball, March Madness, Michigan State basketball, NCAA tournament, Postseason Previews, Siyani Chambers, Wesley Saunders. Bookmark the permalink.